450 million years ago, plants began to colonize land and grow into the wonderful forms we see today. During this process, the picked up a partner in crime: the mycorrhizal symbiosis— a fungal association many terrestrial plants use to acquire phosphorous. Fast forward to 60 million years ago and we see the emergence of the rhizobial symbiosis— a bacterial association used to aid in the uptake of nitrogen in leguminous (like beans, peas, and clovers) plants. These associations represent extreme examples of beneficial bacterial partners known as mutualists. As a PhD student, I am working to improve our understanding of molecular mechanisms that regulate the legume-rhizobia symbiosis. My attention is focused on understanding the careful balance between enabling the mutualistic relationship and preventing pathogenesis. What’s so special about rhizobia? Nitrogen is an essential element for proteins and many other molecules in living organisms. most of the nitrogen we interact with (i.e. ~80% of the air we breathe) is in the form of N2. 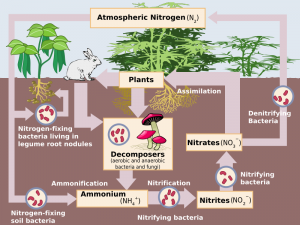 Instead of getting nitrogen from the air, many organisms like plants and humans, will simply take it from alternative sources that exist in the soil (figure 1). However, to get from existing as N2 to existing as a bioavailable source, nitrogen must be “fixed” at some stages. The two natural ways this occurs are lightening strikes and microbial nitrogen fixation. Rhizobia are nitrogen-fixing powerhouses. Nitrogen fixers are organisms that are able to break the incredibly strong triple bond between two nitrogen atoms. In addition to rhizobia, there are many “free-living” organisms that fix nitrogen. Rhizobia are particularly special because they form a relationship which allows them to live inside the root systems of the host leguminous plants. This means that legumes, unlike most other host plants, have the ability to thrive on nitrogen limited land that other plants would be unable to colonize without the help of exogenously applied fertilizers. Which brings us to 1913— the year ammonia was first artificially manufactured using the Haber-Bosch process. This process was a transformative moment for modern agriculture. Gaining the ability to artificially fix nitrogen into a bioavailable form meant that previously unusable land could be more readily converted into farm land. Even more, adding extra fertilizer to already fertile land made crop yields skyrocket…. A win for everyone! Or so we thought. After years and years of applying synthetic fertilizers to our crop lands we are beginning to see the negative effects: increased use of fossil fuels, nitrogen run-off resulting in algal blooms, and the reshaping of microbial and plant communities. Studying the legume-rhizobia symbiosis will hopefully reveal answers to questions that could lessen our global dependency on nitrogen fertilizers. What kind of questions need to be answered? Although this ancient relationship has been studied for many years, many questions remain unanswered. My selected question deals with elucidating how leguminous plants differentially regulate resources to rhizobial partners of varying nitrogen-fixing abilities. Like most organisms, rhizobia of the same species can have varying traits due to varying genetic makeups or other influential factors. One such “trait” is the extent to which a given organism fixes nitrogen. Some fixers, the most beneficial partners, lead to the greatest host fitness and thus are preferentially offered resources from the host plant. Others exist at the opposite end of the spectrum. My thesis work is aimed at understanding what mechanisms regulate this. In addition to this work, I am also interested in how a host’s ability to limit growth of the least beneficial partners may be impaired by certain environmental factors. For instance, I am currently investigating how other members of the microbial community alter the host plant’s ability to differentiate between partners of varying effectiveness. As I mentioned above, the world is swimming (both literally and figuratively) in microbes of all different types— the soil is no different! In addition to understanding the mechanism behind this regulatory phenomenon, it is helpful to understand how various environmental inputs also effect these mechanisms. Why does this matter to me? Hailing from the countryside of Missouri, I grew up surrounded by agriculture. Upon graduating high school, I entered college as a Biochemistry major with no clear idea of what my scientific interests were. 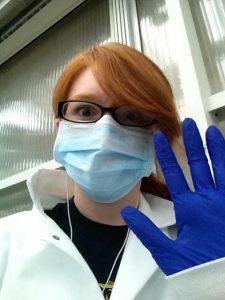 I was fortunate enough to land a job in a plant biochemistry research lab. There, they focused on understanding basic mechanisms of plant immune responses to pathogenic bacteria. I discovered the complex world of molecular signaling events and microbial associations. I learned about the co-evolution of organisms that commonly associate and how these associations drive the development and establishment of complex features of host-microbe interactions. I fell in love with our microbial neighbors. Rodgers, Wiley. “Nitrogen Fixation for Dummies.” City Sown. WordPress, 13 Mar. 2010. Web. 19 Feb. 2017.